NOTE: This content is old - Published: Tuesday, Nov 20th, 2018. Update: The road has reopened. Previous report: Households around the Liverpool Road area of Buckley are without water this morning due to a burst water main. Dwr Cymru Welsh Water have closed the Liverpool Road between its junctions with the Church Road and Globe Way. Traffic is being diverted via the Ewloe interchange, A55, A550 Dobshill and A549 Dirty Mile. “We’re really sorry that your water may be off in Liverpool Road and the surrounding areas of Buckley. We’re working hard to fix a burst pipe and we’ll get your water back on by later this morning. When the water supply is restored some customers may notice some discolouration of their tap water, this is normal in this situation and the water should clear when run from a cold tap. Drivers affected by the resurfacing works currently taking place on the A549 in Mynydd Isa will be directed via the same diversion. 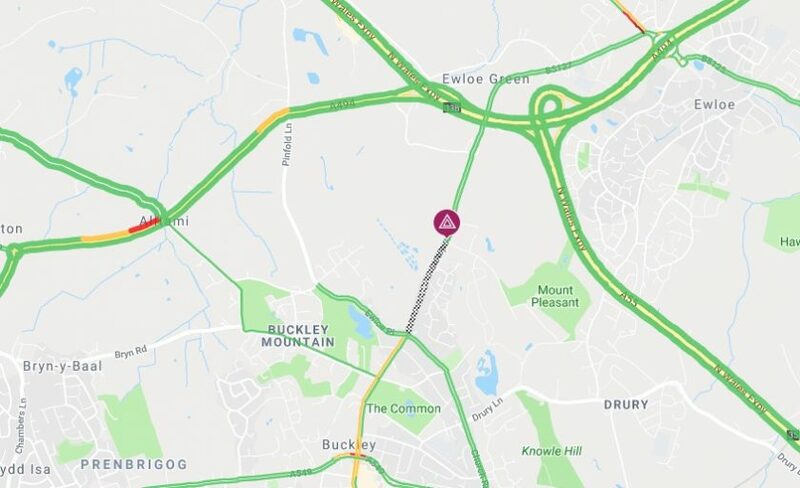 A549 Mold Road, Mynydd Isa between Wylfa roundabout and Chambers Lane is currently being resurfaced, a temporary one way restriction is in place prohibiting vehicles from travelling towards Buckley from Mold.